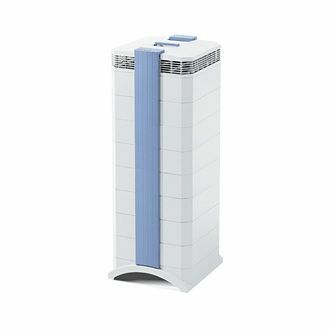 The GCX Series is engineered to provide maximum control of gaseous chemicals in a compact room air purifier. Just like a professional gas mask, the GCX Series relies on an interchangeable cartridge design for optimized gaseous pollutant control. And while molecular control is a particular strength of these systems, the GCX Series also offers excellent filtration efficiency for particles, with its unique performance rated at 99% for particles @.3 micron, 95% for particles @ .003 microns - that's genuine medical grade air quality. 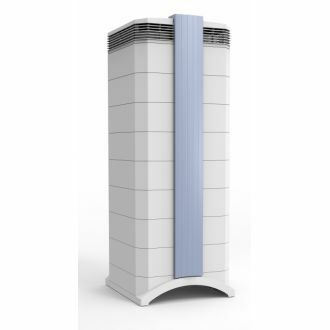 For larger areas +100m2, the IQAir GCX series is a high capacity particulate, chemical and odour control air purifying system. It is available in a variety of filter media to best cater to each situation it may encounter in the work place. It generates from 60 to 540 cubic metres of purified air per hour. Its Multigas (MG) media will remove deadly nitrogen oxides (NOx). This media is also found in the Healthpro 150/250 models and the GC-MG and model. The media choice depends on the prevailing chemicals present. Please consult this Chemicals List to identify any other chemicals present in your operation and note the filter media required. * MULTIGAS EXPLAINED: Charcoal is carbon. “Activated” charcoal is charcoal that has been treated with oxygen to open up millions of tiny pores between the carbon atoms, resulting in highly porous charcoal with surface areas of 300-2,000 square metres per gram. These so-called active, or activated, charcoals are widely used to ADSORB odorous or coloured substances from gases or liquids. The word ‘adsorb’ is important here. When a material adsorbs something, it attaches to it by chemical attraction. The huge surface area of activated charcoal gives it countless bonding sites. When certain chemicals pass next to the carbon surface, they attach to the surface and are trapped. However, many other chemicals are not attracted to carbon at all -- sodium, nitrates, etc. -- so they pass right through. This means that an activated charcoal filter will remove certain impurities while ignoring others. That’s why IQ Air filters contain not only activated carbon but also granules of permanganate, which adsorbs chemicals not adsorbed by charcoal. Once all of the bonding sites are filled, the filter stops working and must be replaced. 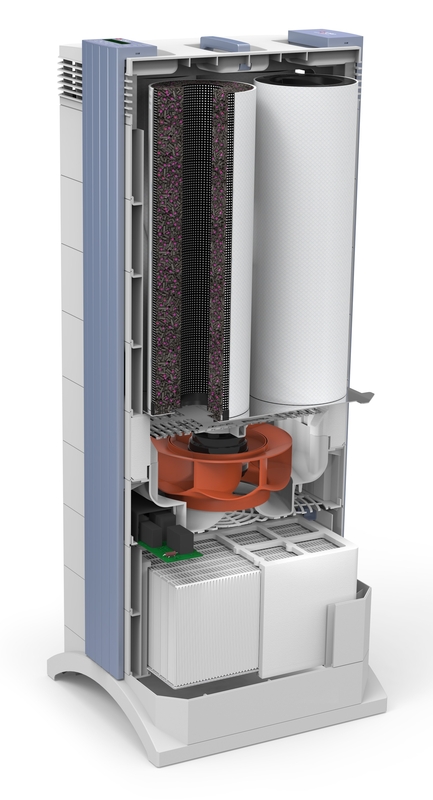 As the GCX also includes IQAir's HyperHEPA cartridge sleeve, the GCX unit is one of the most sophisticated air cleaning system for most commercial environments, providing 99% particulate capture at 0.3µ and 95% of particles at 0.003µ - medical grade air quality. 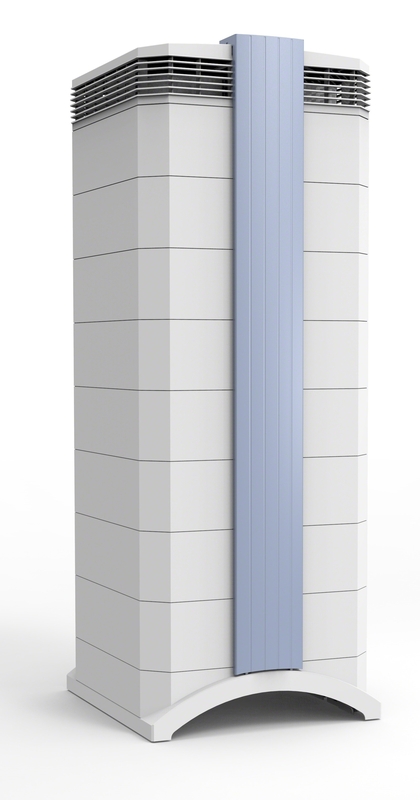 The GCX series alo incorporates anti-tampering features, preventing un-authorised access to filters or un-authorised disconnection of the system in public areas. Compared to the GC model, the GCX model features nearly 75% more filtration media and as a result provides about 20% more airflow and longer filter service life. Numbers below correspond with diagram adjacent. Eliminates micro- and nano-particles such as allergens, smoke, bacteria and viruses. 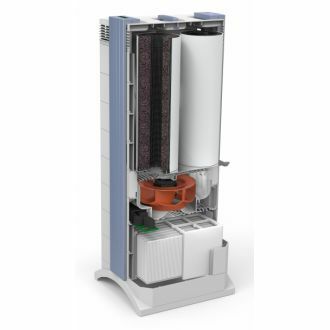 This thorough particle pre-filtration is essential for extending the life of the gas phase control media by preventing its pores from clogging with particulates. Removes 95% particles to .003 microns. Four filter cartridges in the Multigas hold 9.8kgs of granular and pellet-shaped gas phase control media. The cylindrical shape of these cartridges allows for optimum contact, which ensures high removal efficiencies. The large surface area of the cartridges also enables high airflow rates. Eliminates activated carbon and chemisorption abrasion particles through a statically charged fibre structure.